I can’t sleep at night, in fact I’m taking sleeping pills regularly, but my dreams are filled with children grasping on to me for help. The other day one of my comrades (compañeros) sent a foreign television crew to our squatted building for an interview, which was not supposed to last very long. But it went on for two hours. And they wanted to see my old house, where I was evicted from three years ago. I hadn’t been back since, it was completely abandoned and the front door was still boarded up with the same hard plastic material they put up after they tossed me out. It was really painful and difficult. These are the kind of experiences you just don’t want to relive. It seems like we are an endangered species from the Amazon or something. In any case I am not taking part in any more studies or interviews, I just can’t do it anymore. This is a short excerpt from an informal conversation I had at the beginning of the year with a committed housing rights activist in Spain with the Platform for Mortgage Affected People (PAH) that I have had both the honour and pleasure to get to know over the previous months. Her earnest and heartfelt revelation that literally spilled out as we exchanged greetings and news brought to the surface issues I was wrestling with long before embarking on my fieldwork with the PAH, around being an outsider, the relationship between “the researcher” and “the researched” and how my work, skills and abilities can make a meaningful contribution to a broader social movement and hugely important social reality hundreds of thousands of people are facing in the country. This experience brought to the surface a deeply important question: How do we, as activist/militant researchers, respond to the realities of suffering, from various forms of deep social and ecological violence, of those struggles we seek to both better understand and to contribute to? 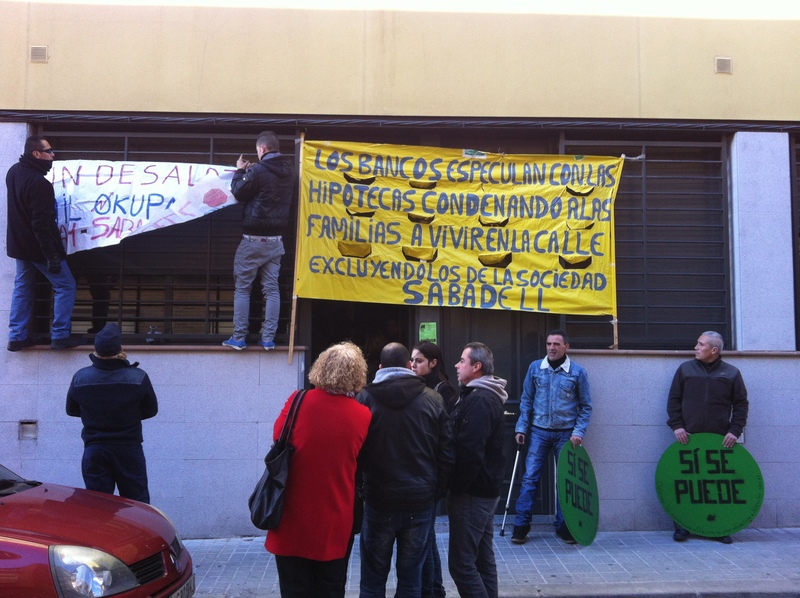 The Platform for Mortgage Affected People (PAH) gathering to block an eviction. Source: author. Before starting any research process in this context, I think there are some key points about the reality of research that we need to understand and internalise. First is that the history and concept of research in and of itself is deeply connected to European colonialism and imperialism, which has led to a lot of research ignoring realities of suffering because they are not deemed “rational” or “relevant” knowledge. Linda Tuhiwai Smith’s excellent book Decolonizing Methodologies can help us understand this point of view, as she unpacks “research as a site of struggle between the interests and ways of knowing of the West and the interests and ways of resisting of the Other” (p.2), and provides over a dozen proposals on how to decolonise research. At the same time, as Kim England (1994) speaks about in a great article on feminist research, “the research relationship is inherently hierarchical; this is simply part and parcel of the (conflictual) role of the researcher.” Being aware and reflexive of these realities needs to form the base of any research that wants to contribute to furthering emancipatory, egalitarian struggles and futures. In some ways the ideal is to have been engaged in a movement long before embarking on a research process, to start from an awareness of the (emotional) realities people are living. Participatory action research (PAR), for example, has long been held as an example of how to co-produce knowledge and learning. But a PAR approach has its own host of ethical challenges related to who participates, how they are represented and a host of ever-present power relations, among many others – showing the hierarchy inherent in the research process. Militant research is another approach that grows out of long-term trust, mutual commitment and political engagement, often through a collective process. As discussed in an excellent volume called Constituent Imagination, it begins “from the understandings, experiences, and relations generated through organising, as both a method of political action and as a form of knowledge” (p.9). Many noteworthy examples of militant research operate outside the academy, and are processes occurring within movements for their own knowledge generation and learning. Within any activist/militant research process, if we are to be sensitive and aware of emotions and deep-seated processes of violence experienced by the subjects of our research, our methods need to reflect this. If we were not part of the movement before, spending extended time engaged with people and places is critical, to build relationships and trust, and also to make contributions to the struggles of which we form part. Through my research, I discovered that so much learning happens from just “being there”. As Sam Opondo has said, it is not just about sense-making but about “sensing”. This connects to the need to value emotions, to move against the tendency to see them as irrational and thus invalid. Chantal Mouffe uses the term “passions” to refer to all the emotional forces that are at stake in the creation of collective identities, which are critical to mobilise to promote democratic forms. There is no simple or easy way to do activist/militant research, and taking this approach from inside academia has its own set of challenges. Many have struggled with this; for example, the Autonomous Geography Collective’s (2010) reflections on the emotional and professional challenges they faced in their two-year research process exploring the everyday lives of activists resisting life under capitalism and building more autonomous ways of living. They provide valuable insights on the messy, difficult and personally challenging research process as activists-scholars. Such reflections are critical to learn from our own experiences and from others, to deepen the contributions we aim to make towards more egalitarian and emancipatory futures.